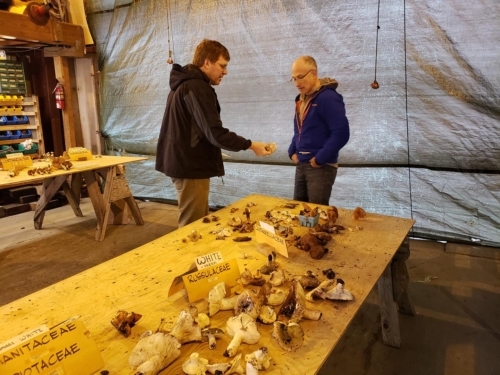 Each year, The Mountaineers pair up with the Puget Sound Mycological Society to host a mushroom weekend at Meany Lodge. 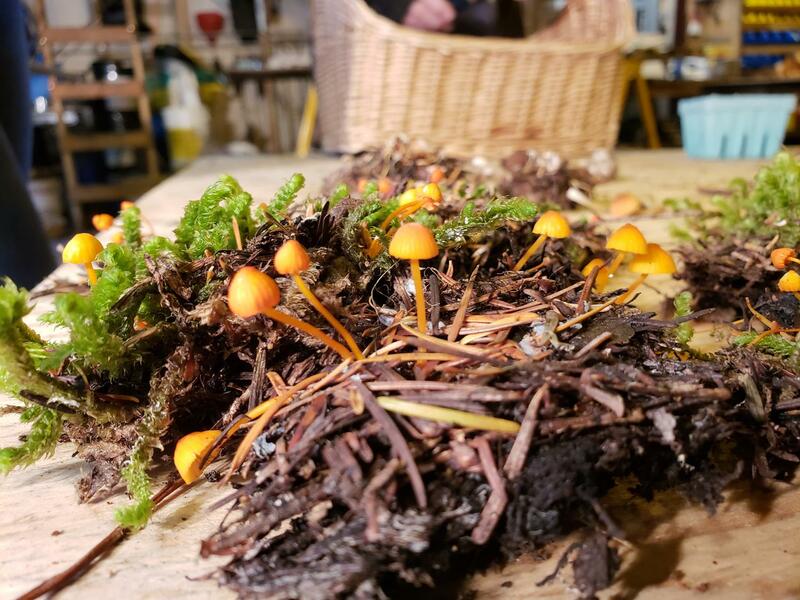 This special weekend offers attendees a great space to learn about foraging mushrooms in the northwest, both for in food and for other purposes. Besides a bed at the lodge, guests are treated to a wide range of mushroom treats and entrees, making this much-anticipated weekend an event not to be missed! 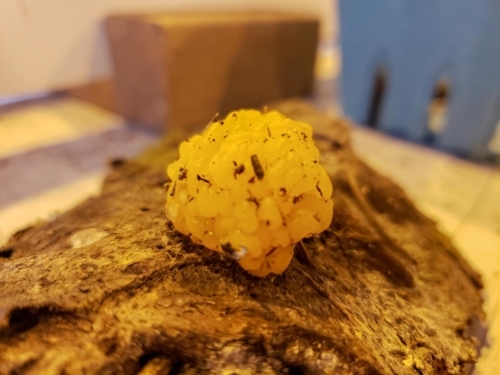 I picked up three other would-be foragers at the park and ride and departed Seattle around 4pm last Friday, October 5. I’d attended two previous mushroom weekends, but my car buddies had never been to Meany Lodge, let alone mushroom weekend! It was raining hard as we drove to Snoqualmie Summit, but I saw it as a blessing since mushrooms usually pop up after a good rain. We stopped at the summit to eat dinner and to kill some time before arriving after 7pm. 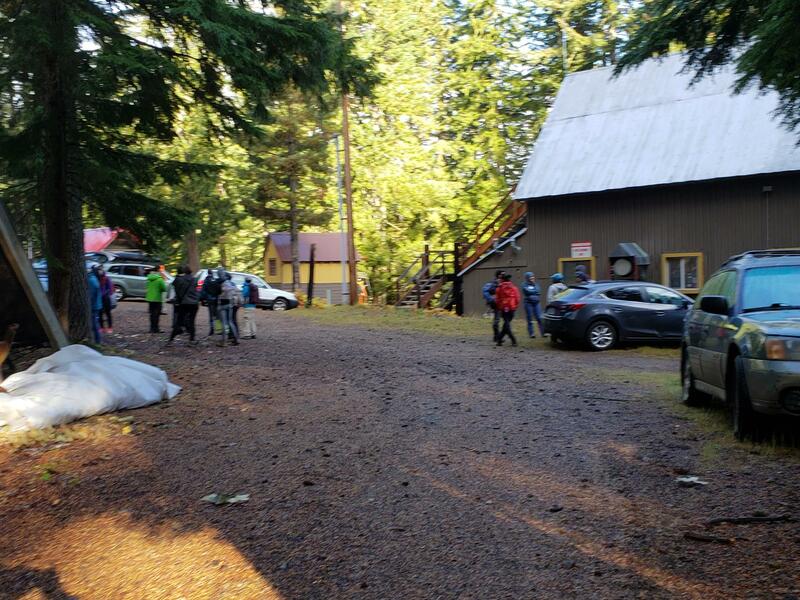 It was dark by the time we arrived, so I was glad our lodge host Chuck was outside directing people where to park (visibility was low between the dark sky and hard rain coming down). Once parked, I quickly led my car buddies inside and directed them upstairs to find a bunk. 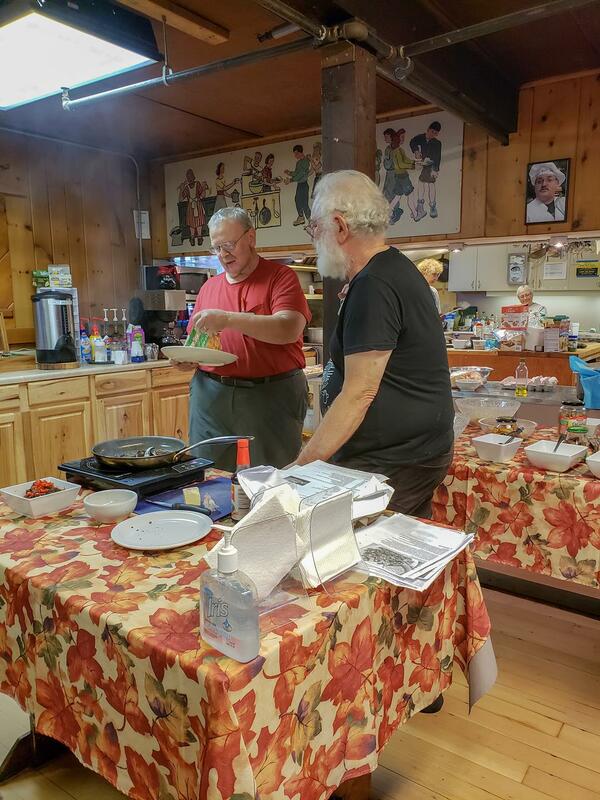 Friday nights of mushroom weekend include an identification lecture (usually with Jerry Stein and Danny Miller) along with mushroom canapes and dessert. The food is worth bragging about; we enjoyed mushroom dip, popcorn with truffle oil, champignons flambés, and wine baked pears filled with orange mascarpone cheese and a wine reduction. 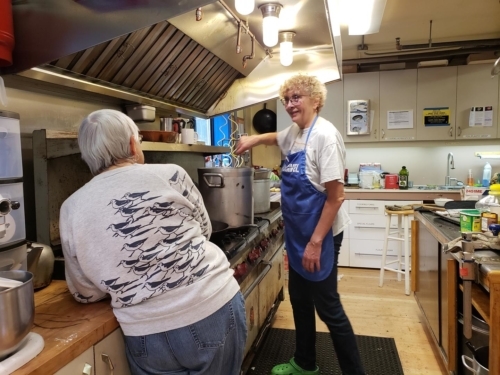 Tea, coffee, and hot chocolate were also available at all times. Lights were turned off at 10:30pm, but I was pretty much half asleep in my bunk by that point. Food coma. I woke up a few minutes before the lights were turned on at 7am on Saturday morning. Breakfast consisted of Canadian bacon, brown sugar baked French toast (so good! ), fruit medley, yogurt, cottage cheese, English muffins, toast, jam, and baked oatmeal with apples & cranberries. 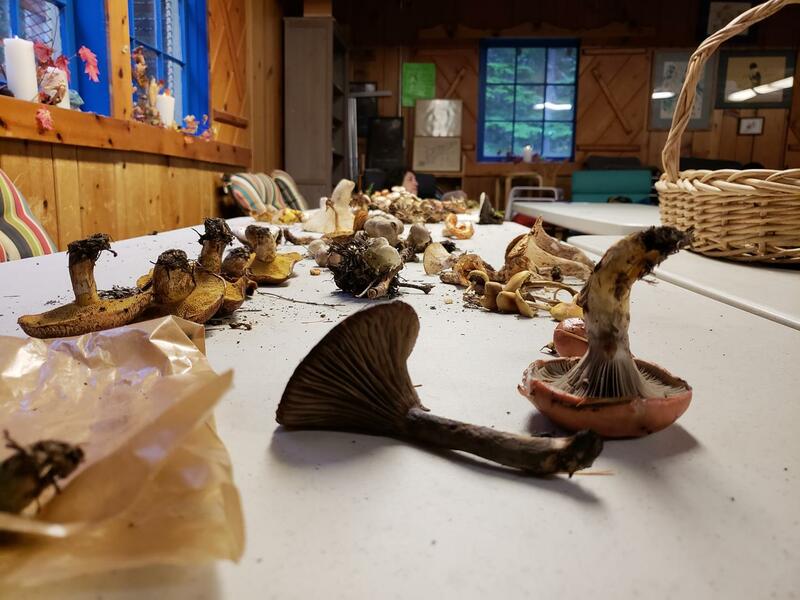 Since we would be out foraging for mushrooms most of the day, we were provided ingredients to make and pack our own lunch. I opted to forage close to the lodge, because I wanted to try and find another huge matsutake (almost 2 pounds) and hedgehog mushroom (about a pound) like I had four years ago. 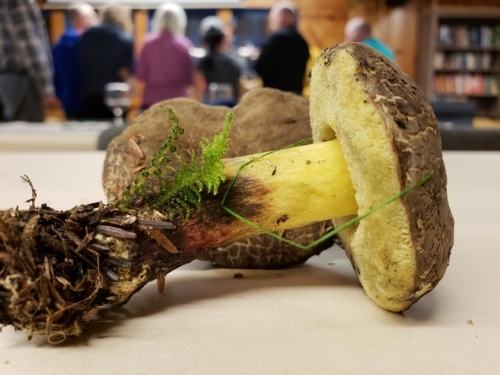 Matsutakes are prized and can run more than $47/lb in a grocery store, so when I found one last time, I took it home and ate it. Yum! 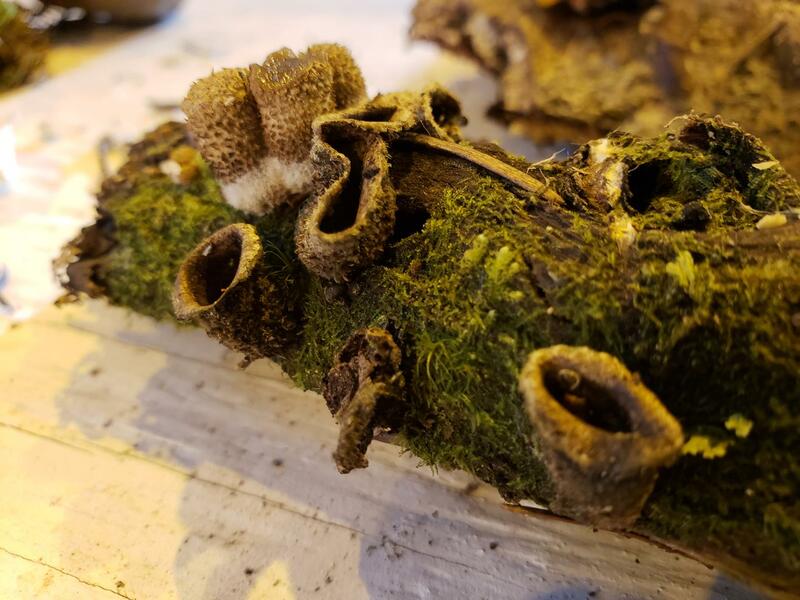 These fungi also have a very distinct odor, which helps you identify them from a similar looking mushroom (once you smell it, you’ll never forget it). Danny led our group of foragers. 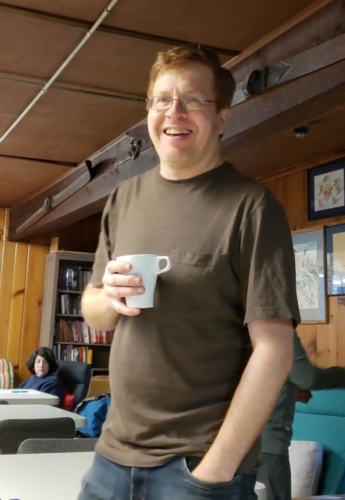 I love being in his group because he’s so knowledgeable and a big sweetheart. 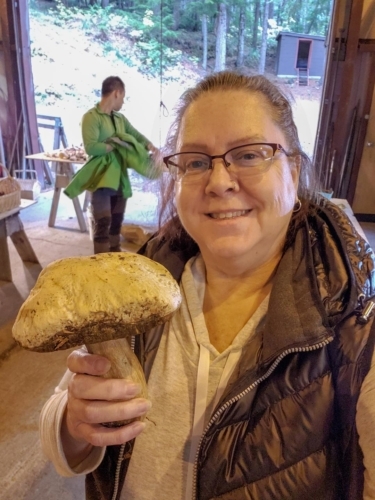 Since I couldn’t find any matsutakes, I stopped foraging around noon and went back to the lodge to eat my lunch and take a nap. In my basket, I had collected a fair amount of bolete mushrooms to take home and dry for future use. After my nap, I spent the rest of the afternoon reading, chatting with other guests/volunteers, and drinking tea. Appetizers were served at 3pm: veggies with morel dip, creamy artichoke & mushroom dip, and mulled fall punch. 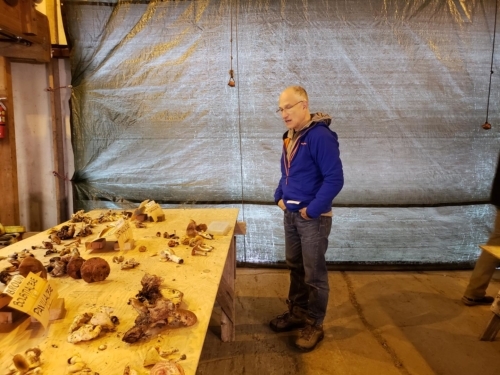 Most of the other foragers returned to the lodge and were taking their finds to the zoo (a shed used to sort and identify the mushrooms). Some people found some white chanterelles. 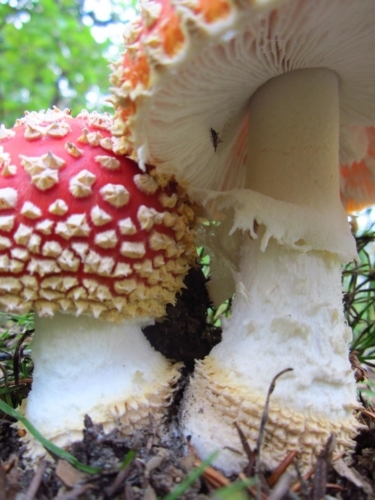 Only two matsutakes were found, both pretty small. 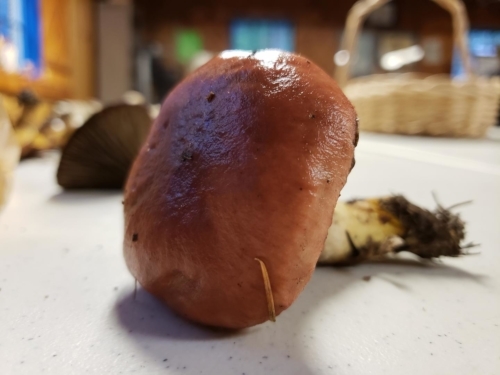 Many boletes of various varieties were found by several people. 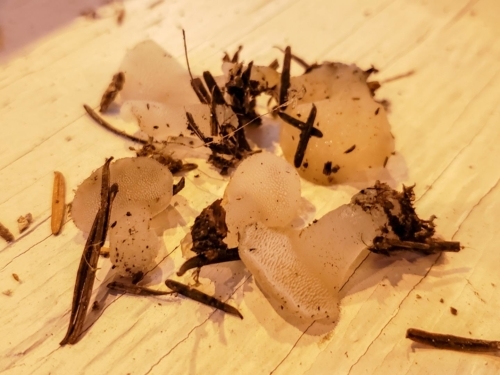 There were also some pretty strange looking mushrooms, like the bird’s nest and jellies. Happy hour appetizers were served at 6pm in the ping-pong room downstairs (while the upstairs was set for dinner). There were tasty, flaky tartlets with wild mushrooms, spinach parmesan cheese-stuffed mushroom caps, crab-parmesan cheese stuff-caps, and some breaded, fried mushrooms. I paced myself, though, because I knew there would be a lot of food at dinner. Dinner was served at 6:30pm. The first course was mushroom parmesan pepper focaccia (homemade) and a mushroom bouquet salad. The main course was green beans laced with mushrooms, chanterelle pilaf, a sweet potato coin topped with a mushroom butter star, and flank steak roulade and mushrooms (the pilaf was stuff inside). Did I mention that the reason I keep coming back to mushroom weekend is because of the food?! After dinner, Danny gave a presentation about mushrooms, giving us an easier way to remember some of the more common types. He’s such a good speaker and had everyone enthralled! When he was done speaking, we were treated to a grand dessert buffet. There were so many choices, but I think I liked the brandy beans the best. I was feeling exhausted from hiking up a steep mountain most of the day (which made my ankles sore), so I was in my bunk and asleep before lights out. I slept pretty soundly, in spite of the thin mattress (though I did wake with a bad back ache). Since breakfast wasn’t until 8am, I slept until 7:15am. After dressing, packing my stuff and loading it in the car, breakfast was served (about 20 minutes early). It consisted of a fruit medley, scrambled eggs with chanterelle mushrooms, tater tots with truffle oil, and sausage patties. After breakfast, those new to the lodge who liked winter sports took a tour of the property, which includes a tow rope. Others, like me, read or socialized. Danny & Jerry were doing more identification in the zoo, sorting and labeling the foraged mushrooms. 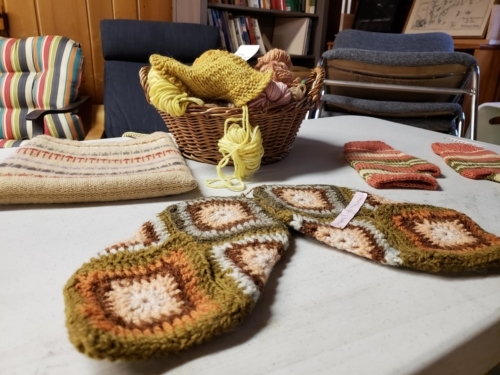 While all that was going on, I talked to a woman who was setting up displays of fashion items, blankets, and more which had been dyed using mushrooms or lichen. I found it very fascinating and now can’t wait to take a class and try some dying on my own! Right before lunch, we were given a cooking demonstration (using mushrooms, of course). Then it was time to eat our last meal of the weekend. More mushroom tasties, mushroom bisque (best mushroom soup I’ve ever eaten! 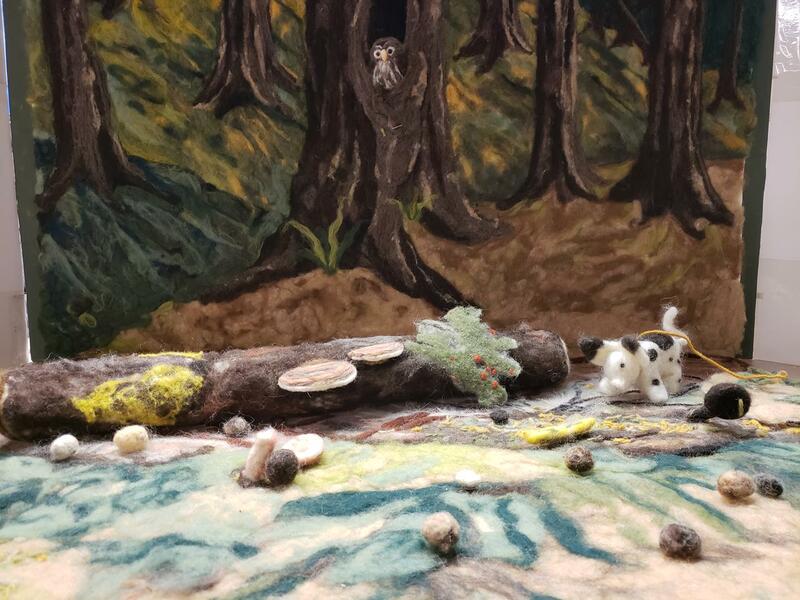 ), a green salad dusted with mushrooms, hazelnuts & cranberries, and dessert (leftovers from the grand dessert buffet and candy cap mushroom sugar cookies). The cookies were very good and had a unique flavor unlike any other cookie I’ve eaten. 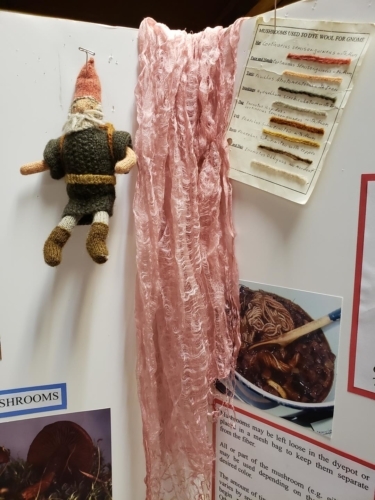 After clean-up and on our way out, everyone was given a shitake mushroom growing kit, mushroom salt, and a pack of sprouted quinoa and brown rice. 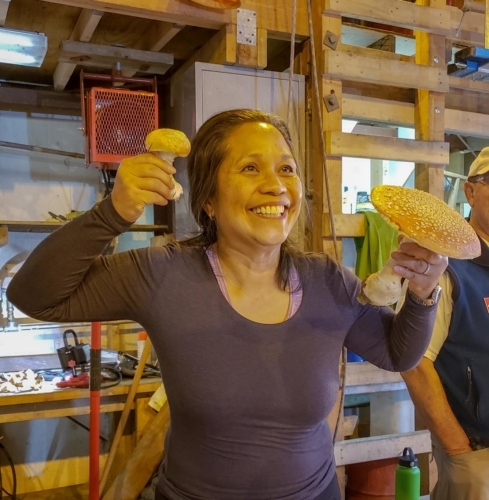 So, even if you don’t care for foraging mushrooms, you can still have lots of fun eating all the delicious food over the weekend…it’s what keeps me coming back for more!